Much has been written about President Obama's reported statement to a Jewish group earlier this month that Israelis should search their souls concerning the quest for peace. In this offensive comment and related remarks, Obama once more put the onus on Israel for the absence of movement towards a resolution of the Israeli-Palestinian conflict, while he characterized Palestinian Authority head Mahmoud Abbas as eager for a fair deal. In fact, Abbas has used the mosques, media and schools under his control to militate against any genuine peace. The message conveyed by all three is that Jews have no historical connection to any part of Palestine, that they are mere usurpers whose presence must be expunged, and that it is the duty of every Palestinian to pursue that goal. In addition, Abbas has personally praised terrorists who have killed Israelis as the ideal all Palestinians should strive to emulate and has explicitly endorsed efforts to delegitimize Israel and its right to exist within any borders. But Obama's hostility to Israel appears impervious to all such realities. Perhaps this should not be surprising, as his jaundiced view of America's traditional role in world affairs is hardly more responsive to counter-evidence. Thus, he pursues the reining in of American leadership, and the reaching out to those who wish America ill, even as his doing so entails, among other travesties, allowing Muammar Gaddafi to slaughter most of his way back to full control of Libya; promising carrots to Sudan's Omar al-Bashir despite the continuing genocide in Darfur; and doing nothing meaningful to help the bloodied people of Iran throw off the totalitarian yoke of their nation's theocracy. Obama's insulting call for Israeli soul-searching reminded many of a similarly hostile statement in July, 2009, in which he urged Israelis to do some "serious self-reflection." But commentary on Obama's "advice," both then and now, has generally failed to note that, for many Israelis, the last decade has, in fact, been one of intense soul-searching and self-reflection. This introspection, for most, has been a radical departure from a decade earlier, when these same people had largely abandoned serious consideration of the realities of Israel's predicament. They had done so primarily out of exhaustion with the unending Arab siege of their nation. For the more than forty years from the nation's founding until the early 1990's, Israelis had envisioned their Arab neighbors ultimately reconciling themselves to the Jewish state's existence and agreeing to peace. They had pinned their hopes on various imagined scenarios. From the time the League of Nations, in 1922, mandated the creation, in former Ottoman Empire territories, of two large Arab states as well as -- in the Jews' ancestral homeland -- reestablishment of the Jewish national home, the Arab world had rejected the latter project and local Arabs had repeatedly resorted to bloody attacks on Jews living in the Mandate region assigned them. Nevertheless, after Israel's creation, many Israelis anticipated the Arab world would accept the Jewish state as a fait accompli. When this failed to materialize, many, recalling recurrent British incitement of Arab attacks on the Jews both before and during the 1947-48 war, theorized that Arab hostility was fueled largely by colonial manipulation. They therefore expected it would dissipate when Britain retreated from the region. When this too failed to occur, optimism shifted to the thesis that the Arab war against Israel was propelled by the machinations of conservative Arab monarchs and would end as they were replaced by new, reformist leaders. Indeed, many Israelis saw the 1952 coup in Egypt that catapulted Gamel Abdel Nasser to power as a harbinger of peace. This also, of course, proved dramatically wrong. It was then argued that hostility to Israel was fed by pan-Arabism and so would inevitably ease as the various Arab nations redirected their attention to their own people and their internal development. Others suggested Arab enmity was encouraged and sustained by Arab despots of various stripes but would disappear with what they believed to be the impending democratization of the Arab world. But the Arab siege continued, accompanied by recurrent acts of anti-Israel terror. In 1967, the siege reached a new level of intensity as Egypt mustered a huge force on Israel's border, declared the time had come for Israel's destruction, and enlisted other Arab states in its planned offensive. When Israel won the ensuing war in dramatic fashion and captured large swathes of Arab territory, many Israelis then anticipated that the Arabs would agree to peace in order to recover lost lands. But instead the Arab nations soon unanimously endorsed the "three no's": no recognition, no negotiation, no peace. Then in the late 1970's, Egypt, under Anwar Sadat, broke ranks with the rest of the Arab world and agreed to a negotiated peace. Israelis now anticipated that this presaged a widening circle of Arab-Israeli accommodation. But Egypt was ostracized by all other Arab states for its accord with Israel. In addition, Egypt refused to implement the approximately two dozen agreements on normalization of trade and other relations that were part of the treaty with Israel. Instead, it fashioned a "cold peace" that has entailed, for example, ongoing intense defamation of Israel in state-controlled media and an actual increase of anti-Semitic propaganda in Egyptian print and broadcast outlets. As the continuation of the Arab siege, and recurrent disappointment in hopes for a change in Arab attitudes, wore away anticipation of a soon-to-be-realized genuine peace, a significant portion of the Israeli public, including the majority of the nation's elites, chose to turn its gaze from the reality of Arab enmity. It averted its eyes as well from the reality of Arab hostility - then as now -- towards every minority, religious or ethnic, living within what Muslim Arabs consider as properly their exclusive domains. This has included, for example, rejection of, and attacks upon, the Christian blacks of southern Sudan and Christians across the Arab world, the Muslim blacks of Darfur, the Berbers of Algeria and the Kurds in Syria and Iraq. Large numbers of Israelis chose to look away from such unpleasant realities and instead embrace delusions of Israeli control over the nation's predicament vis-a-vis its neighbors. They embraced the delusion, despite all the evidence against it, that Arab hatred was actually due to past Israeli missteps and fault and that if Israel would only make sufficient amends, especially retreat to the pre-1967 armistice lines, then Arab hostility would be assuaged and peace would ensue. They insisted that Israel would then not need to concern itself with defensible borders as, in the context of peace, there would be nothing to defend against. They abandoned all serious self-reflection and rushed en masse to endorse the Oslo agreements and embrace arch-terrorist Yasser Arafat and his cadres as their "peace partners." On the September, 1993, evening after the signing of the initial Oslo accords on the White House lawn, Arafat declared in a broadcast to his Palestinian constituents and to the wider Arab world that they should understand Oslo as the first step in implementing the PLO's 1974 plan. This was a reference to the "plan of phases," which called for taking whatever land could be gained by negotiations and using that territory as a base for pursuing Israel's annihilation. But Israel's Oslo enthusiasts ignored Arafat's speech and celebrated the outbreak of "peace." In the ensuing months, and more particularly after Arafat's arrival in the territories, Israel suffered the worst level of terror attacks it had ever endured. Arafat openly praised those responsible for the terror. The Palestinian Authority, then as now, used its media, mosques and schools to declare Israel's existence illegitimate, teach Palestinian children they must devote themselves to the nation's destruction, and prepare the entire Palestinian population for incessant war against Israel. Still, half of Israel ignored all this and continued to focus its gaze on its rosy delusions. "In the early 90's... we, the enlightened Israelis, were infected with a messianic craze... All of a sudden, we believed that... the end of the old Middle East was near. The end of history, the end of wars, the end of the conflict... We fooled ourselves with illusions. We were bedazzled into committing a collective act of messianic drunkenness." But Shavit's opening his eyes was then a rare act among Oslo's true believers, and he was vilified by other "enlightened Israelis." 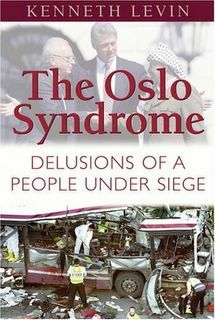 It was only in 2000, when Arafat and his associates rejected Israel's dramatic concessions at Camp David, rejected as well President Clinton's bridging proposals, refused to offer any counter-proposals and instead launched their terror war against Israel, that Oslo enthusiasts in large numbers began to engage in serious self-reflection and free themselves from their erstwhile delusions. The numbers of the disabused grew as the terror war increased in viciousness, claiming more victims on buses, in restaurants, in markets and outside schools. Still more who had resisted serious reflection on Israel's situation began to abandon their delusions when Israel unilaterally evacuated all its citizens and soldiers from Gaza and got in return intensified rocket and mortar attacks onto Israeli towns and villages near the Gaza border. Today, the great majority of Israelis understand they have no "peace partner." They understand the agenda of Hamas, which explicitly declares in its charter, in its media, in its mosques, in its schools, its dedication not only to the annihilation of Israel but to the murder of all Jews, and which daily seeks to translate its words into acts. They understand that so-called "moderate" Mahmoud Abbas, while talking of peace to foreign audiences, makes clear to his own people that he and his Fatah movement will likewise not reconcile themselves to Israel's existence. There are, however, still many Israelis who cling to their Oslo era delusions, people who still insist that sufficient Israeli concessions will somehow transform the Middle East and who persist in misconstruing defamatory self-blame as serious self-reflection. Among them are the much diminished ranks of Peace Now. But then, President Obama, too, mistakes defamatory self-blame for serious self-reflection, as illustrated in his serial apologies for American behavior and in those myriad policies predicated on his jaundiced view of America; policies, again, adhered to despite all evidence of their disastrous consequences. Israel's shift to serious self-reflection, to looking open-eyed at the nation's predicament, did not come cheaply. Nearly 1,500 lives have been lost to the anti-Israel terror enabled by Oslo. With the American population some fifty times that of Israel, a proportional loss would be 75,000 dead. Let us hope President Obama's path from apologetics, and from the hubris of ignoring the world's grim realities, to genuine soul-searching and self-reflection does not entail America's paying such a dear price.